Find Smart & Final Weekly Specials, valid April 17 – April 23, 2019. This Week Ad best deals, and grocery savings on: Fresh Cantaloupes; Cattleman’s Finest Beef Chuck Steaks, Roast; Sweet Seedless Red Grapes; Kellogg’s Frosted Flakes, Froot Loops, Apple Jacks or Corn Pops; Florida’s Natural Orange Juice; Coffee-mate Flavored Coffee Creamer; First Street Sandwich Bread; Ambiance Classic Roast, Single Serve Coffee; First Street Frozen Vegetables; First Street Pasta; Prego Pasta Sauce; DiGiorno Pizza; El Monterey Burritos or Chimichangas; First Street Swai or Tilapia Fillets; First Street Shrimp; First Street Sour Cream; Fresh Iceberg Lettuce; Jif Peanut Butter; Arm & Hammer Laundry Detergent; Pedigree Dog Food; and much more. 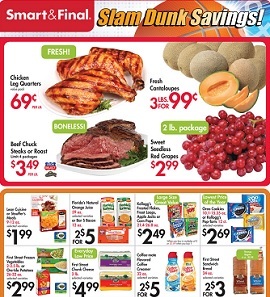 Find all deals, offers, and prices in the latest Smart & Final Weekly Sale Ad Specials.